Well it has been a very busy week here in Las Vegas for the 2017 AWS re:Invent conference. Now that everything is being boxed up and taken away it’s time to look back on some highlights. I won’t go through the entire list of new and enhanced services that were announced this week, it’s far too long. Instead I’ll pick out a few key areas and talk about what they say about Amazon’s strategic vision, and how we at Seamgen might leverage these new services to help our customers. While the variety of EC2 instances continues to grow, including the addition of bare metal instances, this is clearly not where Amazon sees the future of AWS. They clearly see managed services and containers as the future, if not the present, of cloud computing. For example, Amazon recognized that the majority of Kubernetes containers were running on top of AWS, but that setting up and orchestrating these containers was a lot of work. Well, when Amazon sees developers doing a lot of work in DevOps, they find a way to take that burden away for a fee. Enter Elastic Kubernetes Service, which allows you to run Kubernetes in AWS without having to stand up your own cluster. Amazon also just made launching an individual container even easier than launching an instance with Fargate, which allows you to very simply specify your configuration needs like CPU and memory. With second-granularity pricing, Fargate launches your container without your needing to manage the underlying instance. It’s hard to imagine many people wanting the hassle of managing their own instances anymore. The major cloud vendors have been advancing in this space for some time, with Google especially trying to differentiate their cloud with ML and AI features. Amazon may have just one-upped them with this year’s releases. They have extended the Rekognition service to work with video in addition to images, released Comprehend, a natural language processing service, announced their own translation service, and made it easier for developers to build things that respond to voice commands with Transcribe. 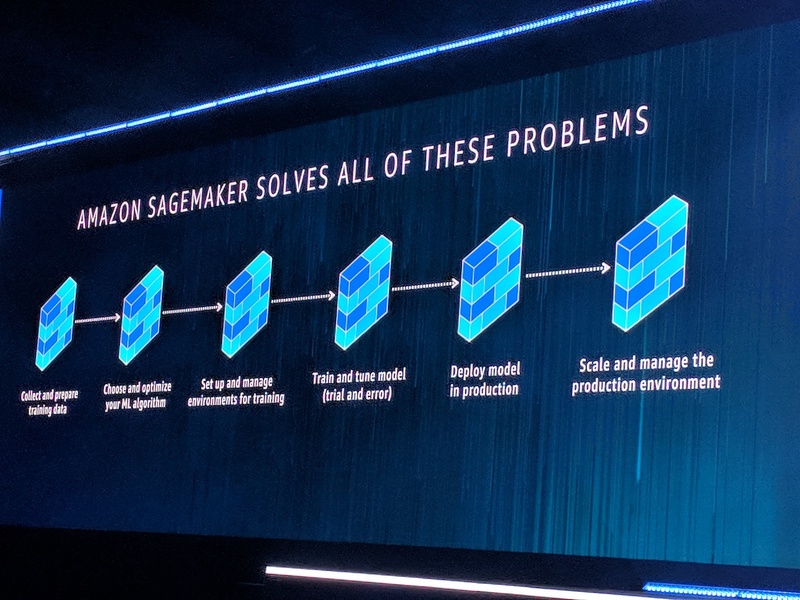 SageMaker, Amazon’s new machine learning service. SageMaker fully automates the build, train, and deploy steps making it possible for developers with little or no experience in machine learning to gain insights from their data. Opening up the world of machine learning to a wider audience is sure to accelerate the pace of machine learning research and adoption. The number of smart devices has exploded. Practically everything that runs on electricity has a micro controller in it, if not a full CPU. Managing all of these devices, and keeping them secure has been a real challenge. Amazon announced a full suite of services to answer these challenges and more. From management to security to analytics, AWS offers managed services to make it easy for developers to remotely support, administer, and monitor smart devices. Ubiquitous smart devices are capable of generating a tremendous amount of data, and transferring and analyzing the data can generate a lot of network traffic. To ease this burden Amazon is actually making it possible to load their ML inference engine directly onto the smart devices, only sending the raw data to the cloud when further processing is needed. Deploying, managing, and studying connected devices has just gotten a whole lot easier. Already the clear leader in cloud database options, Amazon has expanded their offerings even further. They announced Amazon Neptune, a graph database service similar to what Facebook uses to store and query relationship information. DynamoDB, the database that backs much of Amazon’s retail service, got on-demand backup with point-in-time restore, impressively creating backups as large as hundreds of terabytes instantaneously. For those with users around the world, Dynamo Global Tables provides a globally distributed, multi-master database to give your users fast, local read and write. Finally, Amazon’s relational database will soon have a serverless option; starting, stopping, and scaling automatically based on usage. With all of the managed data options now available, the work of maintaining an instance to host a database does not seem worth the trouble. What I’ve outlined here is only a fraction of what AWS re:Invent announced this year, but it includes things we at Seamgen hope to use in 2018. With flexible pricing and ease of scaling, the time to switch from platform hosting to managed services is now. We’re very excited to work with the Machine Learning and IoT services, as we see tremendous growth in both of these spaces. It was impossible to leave AWS re:Invent 2017 without being excited about all of the tools and services AWS now offers. We look forward to using these tools to help our customers build great things in the coming year.